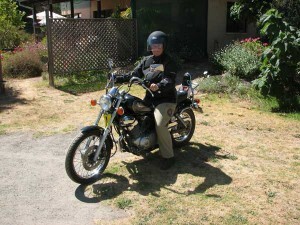 My motorbike and mindfulness training! Riding my bike to town today I was reminded of how learning to ride a motorbike has been one of my most challenging and rewarding ventures in recent years. I thought I had to get my test before turning 60, so that they didn’t decide I was too old to let on the road! Now, several years down the track (and in my 60’s), I can luxuriate in the sense of power, balance and absolute presence that riding my beautiful black machine promotes. However, it was a different story when I started learning. The FEAR was at times almost overwhelming! You know, in your guts, that this piece of very heavy machinery you are riding is dangerous. Its dead weight can easily fall over. It can throw you off, squash you or crash you into anything nearby if you make even a small mistake. If you squeeze the brakes too hard, it will throw you. If you don’t coordinate gear changes and acceleration correctly, it will stall in the middle of traffic or hurl you forward into another vehicle or obstacle. The controls are mostly on the handle bars, with gears on the left and acceleration and brakes on the right and these must be coordinated with footbrakes and the foot pedal controlling the other half of the gear changing mechanism. The problem is that I have a dyslexic tendency to confuse left and right. This sort of confusion is lethal on a motorbike! So the fear had a basis. I knew that I did not know how to ride this machine and that my fear was exaggerating the dyslexic tendencies and making both my body and mind state rigid and “stupid”! When I say “stupid” – which has been a forbidden word for me for many years – I am using it to describe the doing of something that I “know” is wrong or foolish. Or not doing what I know I should have done! In other words, the thinking part of my brain was severely clouded by the fear and stress hormones racing through my body. So I knew I was doing something that could seriously hurt me and I was frightened. But I also knew that I couldn’t know how to ride the bike until I had experience of it and that I therefore had to ‘face the fear and do it anyway’! And this is where the connection with meditation and mindfulness training comes in. I had to allow the fear to be present but not get lost in it. I learned to sit the fear on my shoulder; feel my heart thudding; relax my body (again and again); listen to the internalised instructions I had received and BE PRESENT! There was nothing for it but to practice and trust. 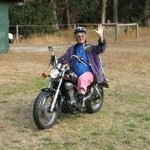 Fortunately, I had excellent tuition from the instructor I had chosen and from Alan – my bikie husband. Both were supremely patient and Alan was particularly good at identifying the mental blocks that were preventing me from safely approaching and managing the numerous roundabouts in the town I was learning in. Roundabouts and road junctions involved integrating the left and right feet and hand controls, in order to maintain control of the bike and stop or go ahead safely. For the beginner – and especially anyone with left/right confusions – these are the real danger spots. Fortunately, once Alan pointed out how my fear was causing me to abandon my normal car driving anticipating habits (of attending simultaneously to the bigger picture and the immediate road ahead), it suddenly got a lot easier, and a lot safer. The fear had restricted my view and disconnected me from my large body of experience as a driver. Once I consciously plugged back into this knowledge base, I found I could drive the motorbike. From then on it was just a question of maintaining awareness and perfecting techniques. And that’s something I will always be working on. As all motorbike riders know, you cannot afford to daydream or go on automatic. Bikes are much less forgiving than cars. But then they do promote a wonderful sense of freedom, power and flexibility. They keep you mindful and present. The ever-present edge of danger seems to sharpen the sense of being alive! There is none of the illusion of safety that a car provides and so one learns to consciously consider and face the risk of sudden death. Life is like a bubble and so it seems important not to waste it. In working as a psychotherapist with my very anxious clients, I have found this relatively recent experience of coexisting with fear to be helpful in understanding them and assisting them to regain their freedom, using mindfulness and acceptance. The increased ability to empathise with their fear strengthened our connection and increased the creative questioning ability, necessary for identifying previously unseen opportunities for change. In conclusion, I am grateful to my bike for teaching me about fear and how to allow fear to be present, without running from it. I am grateful for how it reminded me – at a very visceral level – how there is a gap between body learning and mental learning and how we have to link trust, patience and determination to get through this period before the two come together. ‘True’ bikies may laugh at my Virago as a beginner’s bike, but for me it is strong and powerful. Most of all, I am grateful for how riding my bike continues to promote mindfulness and the joy of being alive. …And here’s a picture to laugh at: me learning to drive in the home paddock – before I got all the proper gear to wear! I googled this because I have been thinking about the strange and wonderful balance I have been experiencing recently, being at my most relaxed and mindful on my motorbike and paradoxically because I can only think about one thing……being on the bike. It’s a curious balance….and I have been wondering about how it happens….. So happy to hear you enjoyed this blog and could relate to it so well. I no longer have my bike but I still really value what it taught me about facing fear and doing it anyway: Luxuriating in the exhilaration and consciously prepared to pay the price that might be exacted if a rabbit or kangaroo ran onto the road. My bike has been a significant teacher as well as a great joy and I feel so fortunate to have had the experience. WOW! What a wonderful read. I too have just started to learn a motorbike and I im really appreciating the vulnerability as it makes every breath seem so much more valuable. Good to get some news of you and Alan. Very impressed with your bike riding skills! Good on ya! The photo is a crack up – you look like an old timer in the saddle! Sounds like all goes well there. Enjoyed listening to some of your interviews and will explore further. Just wanted to say hello and wish you well with the web site.